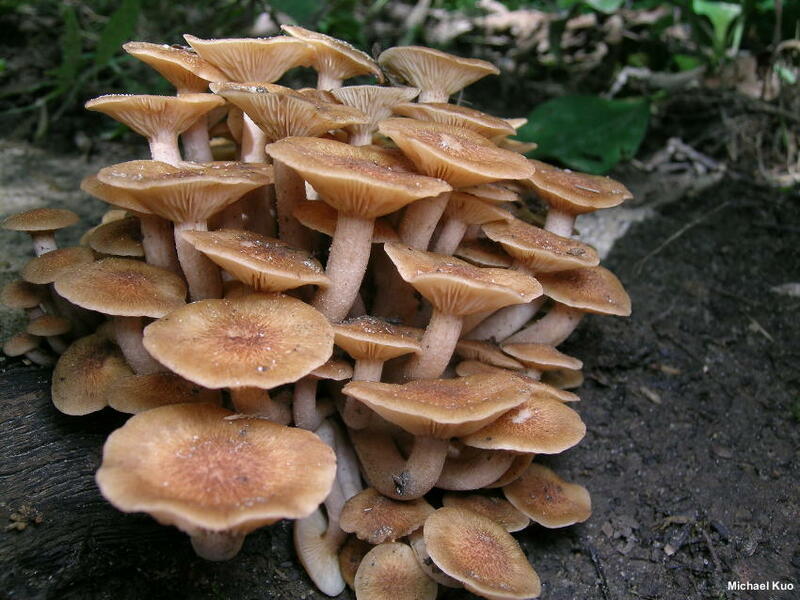 The ringless honey mushroom is the most easily identified North American species of Armillaria. It grows in clusters on hardwoods in eastern North America, from about the Great Lakes southward, and west to Texas and Oklahoma. It has no ring or ring zone on its stem, and it is usually a dull, tawny brown, though yellowish collections are not uncommon. 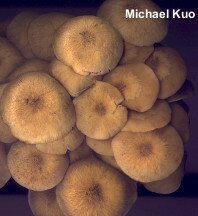 The cap surface bears small brownish scales (at least when young), and the stem bases are fused together and somewhat pointed. 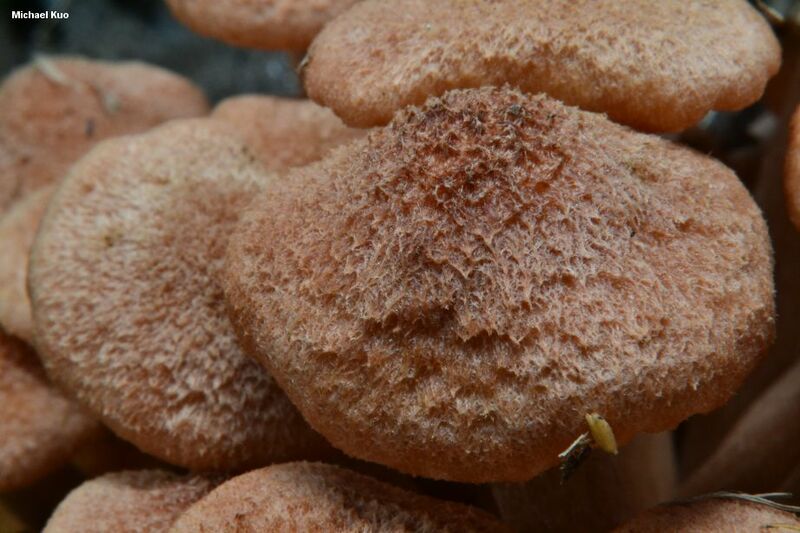 In my area (central Illinois) Armillaria tabescens is a prolific late summer and early fall mushroom. 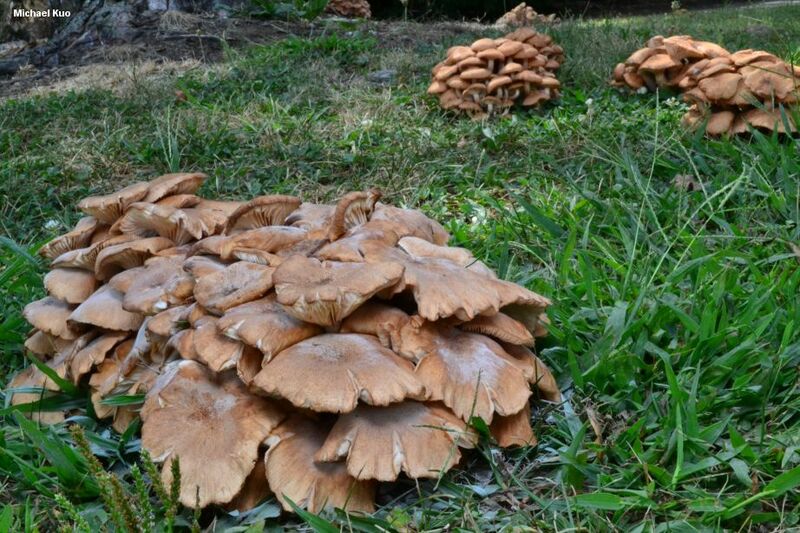 It almost always appears several weeks before Armillaria mellea, and can be seen in large clusters on lawns following heavy rains—or even in dry periods. It pops up quickly—seemingly overnight—and often appears terrestrial, though it is actually growing from buried roots. Armillariella tabescens is a synonym. Ecology: Parasitic and/or saprobic on hardwood roots, especially those of silver maple and oaks. 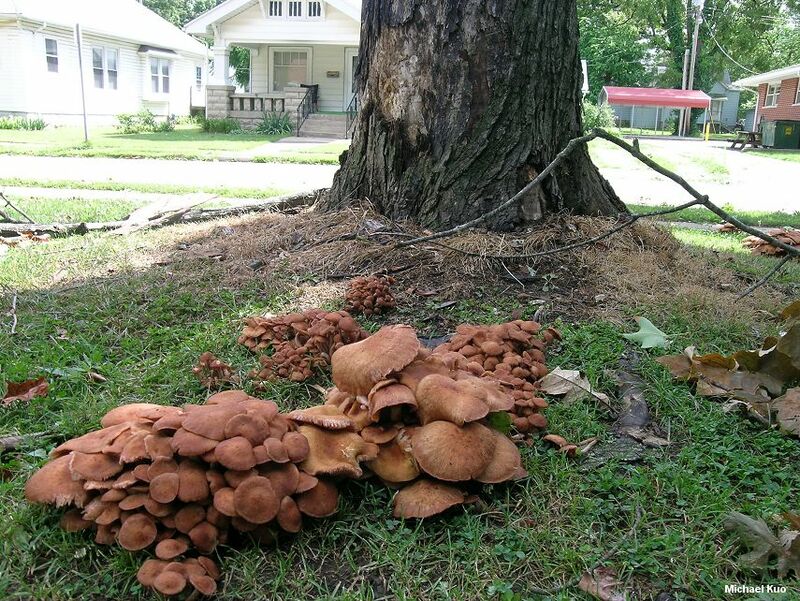 I have examined trees attacked by Armillaria tabescens several times, and have never found the black rhizomorphs characteristic of Armillaria mellea in wood or bark above ground. Armillaria tabescens, as I have seen it, fruits directly from roots and rootlets, attached to them with white mycelial fuzz. 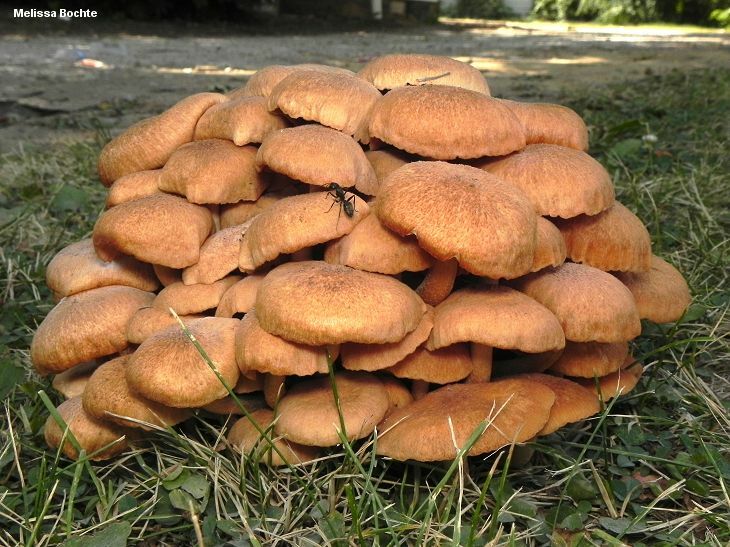 The mushrooms typically appear in large clusters at the bases of trees (when the clusters appear to be terrestrial they are actually growing from underground wood) in late summer and fall, east of the Rocky Mountains. The illustrated and described collections are from Illinois and Kentucky. Cap: 3–6 cm across at maturity; convex at first, becoming broadly convex, flat, or shallowly depressed in age; dry; when young covered with darker brown scales, but at maturity the scales are often concentrated near the center and vaguely radially arranged; tan to tawny brown or cinnamon brown—or sometimes yellow to yellowish; the margin often becoming slightly lined. 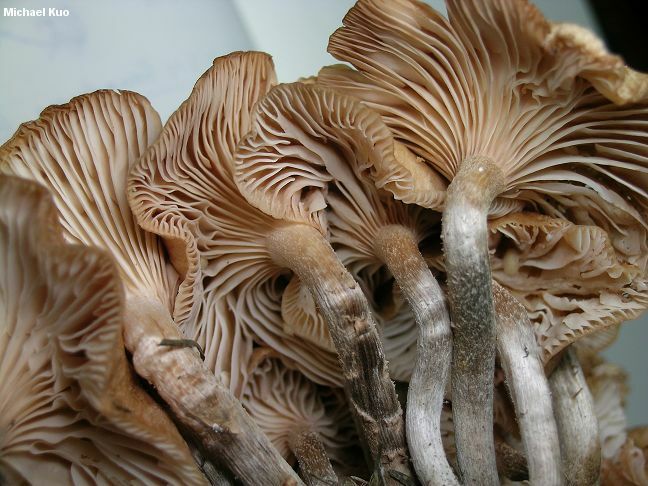 Gills: Running down the stem or nearly so; close or nearly distant; short-gills frequent; whitish with pinkish hints; sometimes bruising or discoloring slightly pinkish to brownish. Stem: 5–8 cm long; 0.5–1 cm thick; tapering to base; bald and pale grayish to brownish near apex, darker brown and nearly hairy below; without a ring. Flesh: Whitish to watery tan; not changing when sliced. Odor and Taste: Odor not distinctive; taste bitter, or not distinctive. Chemical Reactions: KOH negative to red (yellow caps) on cap surface. 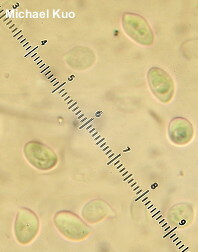 Microscopic Features: Spores 6–9 x 4–5 µm; ellipsoid; with a prominent apiculus; smooth; hyaline in KOH; inamyloid. Cheilocystidia 25–40 x 5–10 µm; clavate to subclavate, cylindric, or somewhat irregular (occasionally nearly lobed and/or digitate); septate; thin-walled; smooth; hyaline in KOH. Pleurocystidia not found. Basidia 2- and 4-sterigmate; not basally clamped. Pileipellis a collapsing trichoderm of hyaline to brownish, frequently septate elements 2.5–7.5 µm wide. REFERENCES: (Scopoli, 1772) Emel, 1921. (Saccardo, 1887; Kauffman, 1918; Smith, Smith & Weber, 1979; Weber & Smith, 1985; Arora, 1986; Berube & Dessureault, 1989; Phillips, 1991/2005; Lincoff, 1992; Metzler & Metzler, 1992; Horn, Kay & Abel, 1993; Volk, 2003; Miller & Miller, 2006; Kuo, 2007; Binion et al., 2008; Kuo & Methven, 2014.) Herb. Kuo 09190101, 07010306, 09300407, 08311301.